So, the “big picture” takeaway for me was definitely Max Ray’s “I notice, I wonder”. I just love the wording of that! It’s so inviting; everyone can notice something, and everyone wonders about things. The basic idea is that when you present the students with the scenario you want them to analyze, first ask them what they notice, then what they wonder (and give credit to all ideas). Simple, brilliant! And when I really thought about it, I noticed that I had been trying to ask these questions of my students all along (in both my physics and algebra classes), but I had been fumbling the wording. 😦 I would say things like “so how does this work?” or “what’s going on here?”. 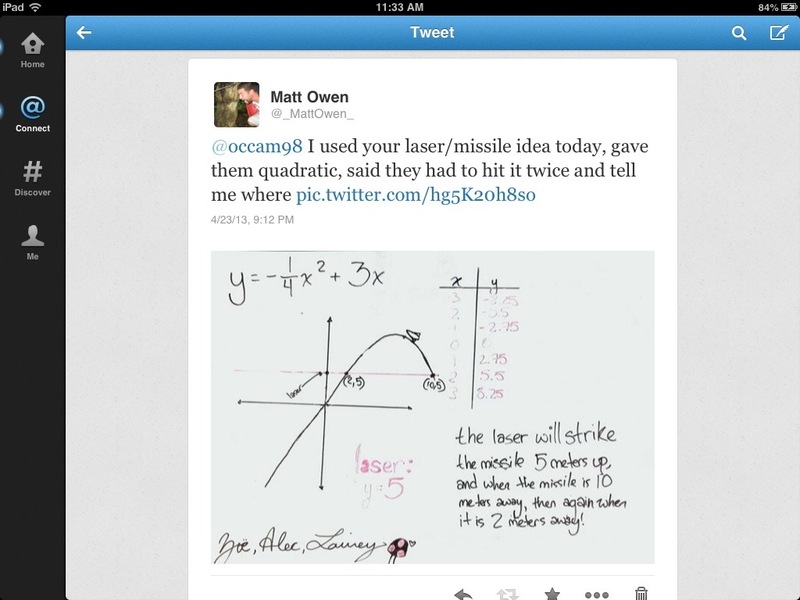 Duh, Mr. Owen, if they knew what was going on already, then they wouldn’t need the lesson. In Max’s session, I noticed that after we had done a few minutes of noticing, some people started throwing out things that they wondered too. I wonder if it’ll be that easy with students, I hope so. I also learned about what makes for a good group work task and how to implement one. Thanks to Anna (@Borschtwithanna) and Jessica (@algebrainiac1) for that one. Main takeaway from their session was that to be a good group task, there need to be multiple obvious ways to solve it. What a great way to get kids talking about math, have them solve the same problem and then debate who did it the “best” way! That may not have been the main point of the session, but that’s what I got out of it. While that session was on the topic of group dynamics, I also attended a great session on building a class community. It was Sadie’s (@wahedahbug) session on Counting Circles. A counting circle is a classroom routine that builds number sense. It’s pretty much what you would think a counting circle is. Sadie suggests chapter 4 of this book to get started (I have not had a chance to check it out yet, but will soon). The book is for K-3, but the concept is totally scale-able. It’s not just about counting! For instance, let’s say we’re going around the circle counting up by 1/2s, then I stop and ask “what number will Suzie be?” (Suzie is 7 kids from where we stopped). Some of my kids will go straight to a linear function to solve that, some won’t. But that’s just it, the methods will all be on the table so we can share and learn. But I think the biggest reason I’m gonna use it is for the confidence building. As we started the counting circle with a group of math teachers, several of us commented that we were nervous. Imagine how the kids will feel! The thing is, we’re all in it together. I felt like a part of a mini community in our session and that was after doing it once. If I make this part of my class routine, my hope is that the kids will feel that same sense of community. This should make them more confident and less afraid to share out, and that’s in addition to the numeracy skills we’re building. It was also great having Team Mathalicious there. I had already planned on utilizing some of their lessons, so having them explain their thought process really helped me out. I feel that after attending their sessions, I’ll be not only better at implemented their lessons, but also better at writing my own real world lessons, based on my own and my students specific interests. It didn’t hurt that Steve Leinwand and Ann Lawrence were both in my lesson writing session, throwing out ideas and asking good questions. I also learned way too much to type by just talking to people. The importance of these face to face encounters cannot be overstated. I think that was the best thing about the camp. Every conversation I had was amazing! Some were not math related (which is a good thing! ), but a lot of them were. And it was super obvious that everyone there has a passion for what they do. Specifically though, I saw a passion for math (or maths for our British friends) in many of the attendees. 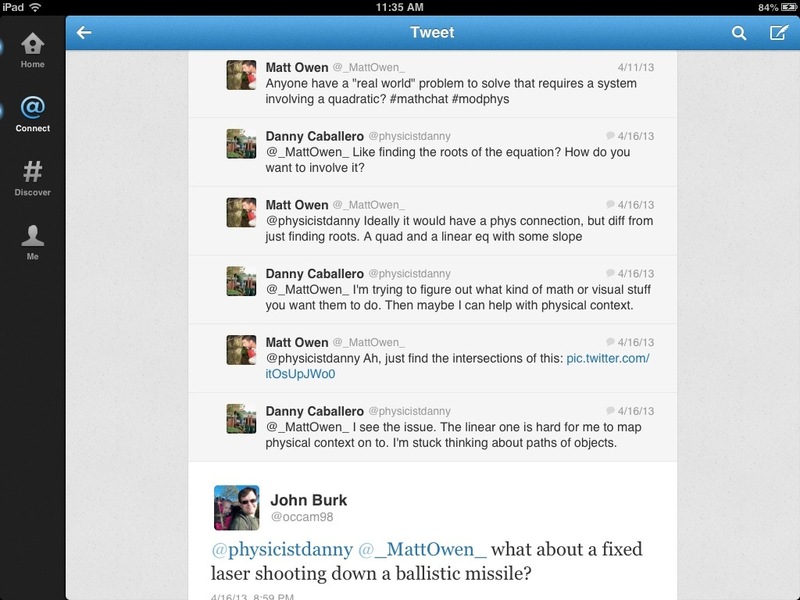 What I mean is that they were in one way or another involved in doing mathematics, not just teaching it. In his Mathematicians Lament, Lockhart talks about how we don’t get music teachers that don’t play music. The implication is that we do have math teachers that don’t “play math”. And that has definitely been true of me. It’s not that I don’t like math (especially to play with), but I haven’t been doing it, really. So I had a few conversations with Edmund Harriss (@Gelada) and he totally convinced me that I need to. Not because I’m a terrible teacher if I don’t play with math and constantly work at new problems, but rather because it is fun. For example, he asked me if I had heard of the 3x+1 problem. It goes: take a number, if even —> take half, if odd —> 3x+1 it, then repeat till you get to a loop. Try it with 3: 3 – 10 – 5 – 16 – 8 – 4 – 2 – 5. And bam! there’s the loop! Now try 23. Have fun! But where it really gets interesting is in the mathematical art. Check out some of Edmund’s stuff, amazing! And after seeing the things he did with Desmos after only a few days of playing around with it, I’m convinced that I need to play around with math more. Of course, kids like to play too, I just need to give them some toys! So, there it is. Teach math better, play with math more. Get on Twitter and find some like minded people there. Here’s just a few examples of how my Twitterings have helped me and my students this year (there are like a bajillion of these too!). 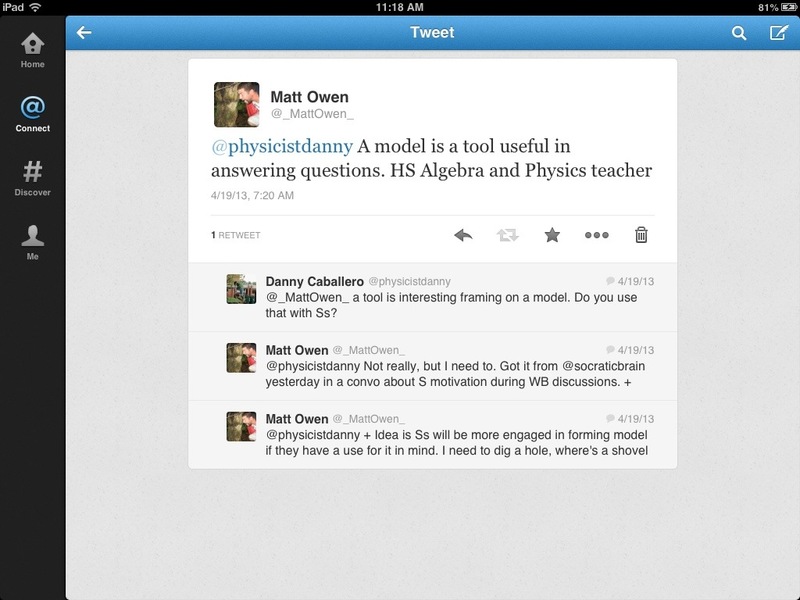 I follow Danny (college physics) and he posed the question “What is a model?”. You can see my reply and explanation there in the pic. What’s awesome is that this collaboration went from the classroom to twitter, then back again. Literally the next day in class, I used the analogy of a model being like a tool. We were in a circle holding up our whiteboards to show what we had learned from a lab. I told students to think about digging a hole. What would they do first? (Get a shovel) Then I said “the board you are holding is your shovel!”. Some of them were holding spoons we decided, and since it’s pretty hard to dig a hole with a spoon, we better figure out how to make those boards better. I think it is very important that HS teachers begin talking more with college professors so that we can figure out where there may be gaps in kids’ knowledge between our classrooms. And so we can share ideas on best practices in teaching and learning. Guess where we all are? The best idea in collaboration since the mathtwitterblogosphere: the CCSSM Draft! Last night, a small group of teachers decided to NFL-style draft their two favorite common core standards from grade 8, along with one math practice standard, and then create a lesson with them. Here’s the story of how the whole thing shaped up over the course of a few hours on a Friday night (it’s a little long, but give it a chance!). What I especially love about this is that it feels like our version of Genius Hour (a sort of free for all learning time). 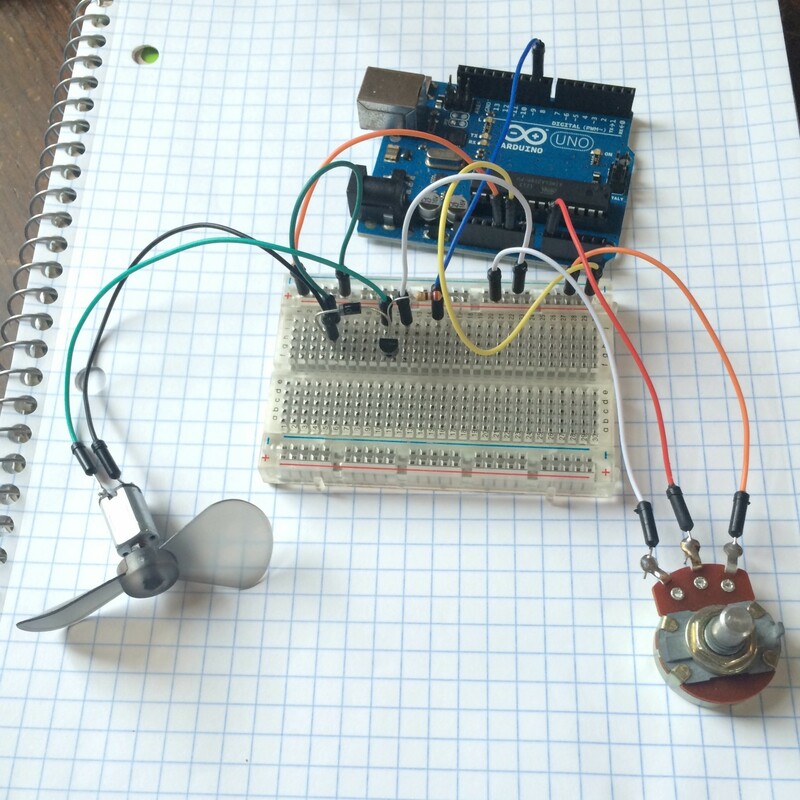 I would love, love, love for my students to have Genius Hour in my class next year and so the chance to model what it looks like and what you can get out of it is awesome! 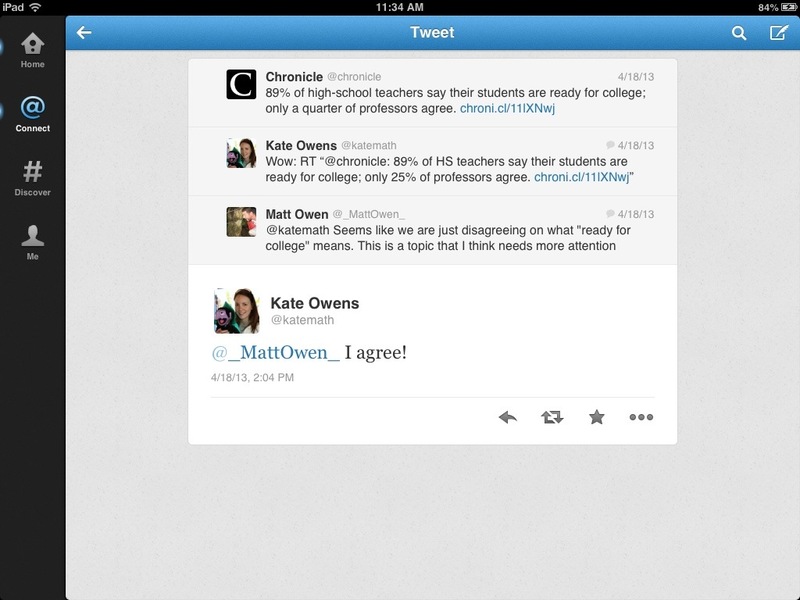 Bonus: the link I provided up there for Genius Hour also shows how powerful Twitter can be as a collaboration tool. Man, do I feel like the major underdog on that list for the CCSS Draft! I better bring my A game. 😉 And that’s the point, right? Give kids some time to work on something they care about, and they’ll bring their A game too.